As one of the largest manufacturers of foam case inserts in North America, we have a lot of experience in specifying and designing all types of protective cases. Based on this experience, we at UFP Technologies have partnered with Pelican Products to offer their full line of cases. In our experience, Pelican shipping cases represent the finest product on the market. Listed below are some of the properties that make them so durable. In order to maintain wall strength while minimizing weight, Pelican shipping cases utilize an expanded polypropylene closed cellular structure that results in the highest weight/strength ratio in the industry. While the process to manufacture cases in this manner requires more time than traditional injection molded cases, it yields cases that are virtually indestructible. To alleviate issues surrounding the durability of hinges and latches associated with most shipping cases, Pelican molds in graduated deflection ribs that direct impact force away from the case without shattering the ribs. Pelican engineers learned long ago that springs corrode, latch tabs bust, and wimpy push button latches are easy to jam. 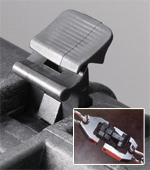 Even for cases not intended for harsh environments, the latch determines the usefulness of the case. After inventing the C-clamp design decades ago, Pelican now uses this same design with a secondary lever for easier opening. This Double-Throw C-clamp latch has been pull-tested to 382 pounds, a key reason that Pelican can guarantee their cases for life. Changes in altitude during travel result in increased or decreased ambient pressure. These conditions will cause an airtight case to develop a vacuum making it impossible to open the lid. To address this issue, Pelican cases utilize automatic purge valves that incorporate a GoreTex® membrane. Since air molecules are smaller than water molecules, the valve allows air molecules to escape while still keeping water out. One area of shipping cases that is subject to the highest shear forces are the handle area. That is why Pelican cases utilize multi-blade hinge bases that distribute shock loads and beveled handles that deflect impact. They also incorporate non-removable stainless steel pins that won’t corrode and most cases have over-molded rubberized handles for a comfortable, no-slip grip. To help in the transport of our larges cases, pull out handles and wheels are added to the case. These wheels are constructed with stainless steel ball bearing axles with a nylon hub that is molded onto the axle to insulate the tire against the heat generated by the bearings. Quiet rolling polyurethane tires are then molded onto this hub. Each wheel is rated to 80 pounds and larger cases utilize for wheels so that the cases can accommodate up to 320 pounds. All Pelican Shipping Cases are backed by an Unconditional Lifetime Guarantee.